I’m Alin, one of Pixelgrade’s Happiness Heroes, and a true fan of delivering outstanding experiences to our customers. Nowadays, customer support means so much more than finding solutions to specific problems. Leaders from the industry (such as the great crew of Help Scout, Basecamp or Intercom) have brought this activity at the adult table, and gave it the attention it deserves. As a Happiness Hero at Pixelgrade, I’m trying to be in touch with this chain of transitions in order to better understand its challenges. Therefore, in the last couple of months I ran several analysis regarding how we can create and duplicate more WOW moments with our customers. I had a strong focus on digging after meaningful insights that allow us shaping a lovely experience for the people who’re buying our WordPress themes. What I’m going to share next is from my experience and a lot of trial-and-error. I’m pretty far from talking about a book’s summary or yet another ‘‘Top 10 reasons to impress your customers’’ kind of story. Let’s face it. There are tremendous companies that offer almost similar quality for comparable products. The only asset that can still make a difference is the customer experience they’re providing. Doing a great job in this area improves customer satisfaction, fosters customer loyalty, increases revenues and creates a strong competitive advantage. WOW moments mean nothing less than having the right attitude and the desire to go even further for customers’ goals. To know what defines your working relationship and to act accordingly. To practice empathy on a daily basis and to become better at it. In some senses, it is pretty similar with having a strong liaison with a friend. You might think that you know best your customers’ wants and needs. No you don’t. So stop asking questions about you and start exploring ways to provide solutions. Put yourself in their shoes, and don’t try to close the ticket just for the sake of finishing your job sooner. Because you will struggle twice if you do that. There’s a strong negative correlation between time response and customer satisfaction. As the response time increases, customer satisfaction drops. I do believe that speed is important, as long as the quality stays on top. Feedback such as “Great, quick support as usual. Like what you are doing.”, “Great response and ultra-fast!”, “Great support, really fast and friendly !” highlights this truth. The more you know about your customers, the better you will approach them. That’s why I pay extra attention on specific details. Intercom, for instance, offers a bunch of insights that are useful in this sense. Moreover, I always keep in mind that someone who buys a photography theme has a particular way of reaching out, while someone who’s looking for building up his first blog has totally different expectations. No matter how hard you try to make everyone happy, the truth is that is impossible to make such a dream come true. We all have to confront bad reviews or complaints. I learned that the most important thing in dealing with this kind of situations is attitude. Help people with pleasure and patience and they will not remain indifferent. This is definitely a must-have and must-do. It is highly valuable to get back to clients after a specific timeframe. Find out why they were happy or unhappy (especially unhappy), and take notes. Write down their own words. You will be surprised what people use to remember, and you will also have a second chance to make things right or even to create a WOW moment. Even when the problem is not related to your product, you can still create memorable experiences by suggesting an alternative. People will appreciate helping them, especially if this is not your job. They will remember having a nice experience, and in the end they will reach you back. However, this doesn’t mean it is a good idea to dilute the effort and start being an assistant for everyone. I’ve learned that these WOW moments are rewarding on multiple levels. For me, as a Happiness Hero, they keep my wheels spinning in the long run since they’re a generous source of gratitude and balance. For us as a team with a strong focus on delivering a meaningful experience for our customers (we even wrote an ebook about this topic), they’re like an honest mirror that shows us if we did or did not a great job. 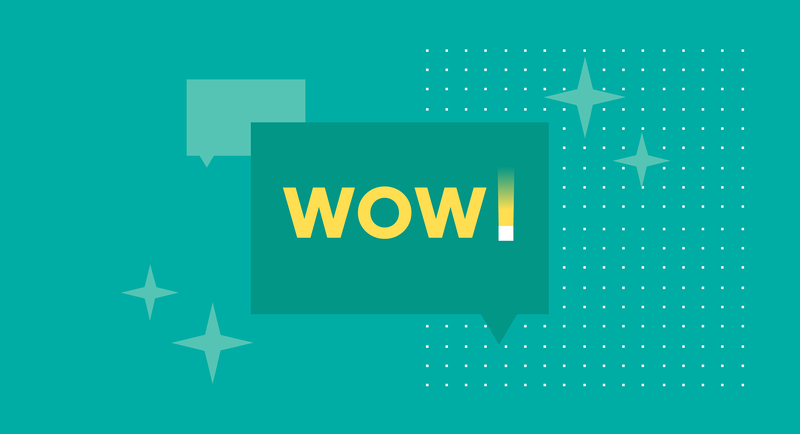 Would love to hear your thoughts about creating WOW moments for your customers. Please write down in the comments section how you guys manage to make people happy in the very long run. pixelgrade is a design studio where we create outstanding WordPress themes that solve real and painful digital problems. Reach us out at hello@pixelgrade.com or send over a tweet.